I believe that information is power. Whenever I'm interested in anything, I research the heck out of it. Tiebreaker's diagnosis was no different. In the weeks following the initial ultrasound, I spent most of my free time doing scouring the Internet for information. I also had a lengthy e-mail correspondence with an online friend whose daughter has bilateral clubfoot. Here are the most helpful resources I've found. On the right, I have a blogroll of other blogs of parents on the clubfoot journey. If you have such a blog and would like to be added, please leave a comment or e-mail me! I couldn't find many books about clubfoot written for the layperson (i.e., a non-medical professional). 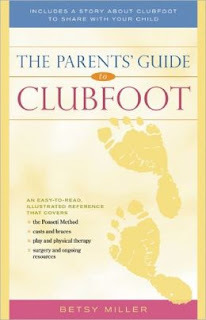 The Parents' Guide to Clubfoot by Betsy Miller is one of the very few available. It was written in 2012 so the information it contains is very current, and it's available in paperback, for Kindle, or for Nook. I purchased the paperback version because I only have the Kindle app for iPhone, and I thought any pictures or diagrams would be more easily visible in the paperback as opposed to my small iPhone screen. Also, there's a section at the back that contains a book for kids about clubfoot, and I thought it would be easier to read it to them from the actual book. If you have an iPad or an actual Kindle or Nook, though, I think the electronic version would be just as good. It is an excellent resource, and I highly recommend it for any parent of a child with clubfoot or even for anyone who wants to learn more about the condition. It has helped me feel more prepared for our baby's treatment, and contains many success stories from other parents. She also has a chapter about finding a Ponseti-trained care provider, "red flags" to look for when interviewing care providers, and information about online support groups that will be helpful for any parent whose child's clubfoot was diagnosed prenatally, as Tiebreaker's was. The staff at Phoenix Children's Hospital Center for Pediatric Orthopedics, where Tiebreaker will be treated, gave me a folder with several concise, informational PDFs about clubfoot, and I was pleased to see they were also available at their website for download. The best online support group I've found is the Yahoo! Group nosurgery4clubfoot (this group is also highly recommended in Betsy Miller's book). So far, it's been a valuable source of information, and it's great to be able to chat with other parents who are on the clubfoot treatment journey. This page on Clubfeet.net contains six YouTube videos about clubfoot. The first four comprise a complete documentary about clubfoot and the Ponseti method of treatment -- I found these very informational and helpful. The last two videos are of various medical professionals discussion clubfoot and its treatment. This video features the doctor (and the facility) who will be treating Tiebreaker's clubfoot! I met him for a consultation appointment on August 8 and was very pleased by his knowledge and his manner. This is another video about the treatment of clubfoot by Phoenix Children's Hospital, the facility where we'll be taking Tiebreaker for treatment, and again featuring his or her doctor. It also contains interviews with several parents who had their children's clubfoot treated there. This video was created for the University of Iowa Department of Orthopedics, where Dr. Ignacio Ponseti (creator of the Ponseti method of treatment) practiced, for the purpose of promoting Dr. Ponseti's work. This a great peek into the history of Dr. Ponseti's method and his success with it. It was made while Dr. Ponseti was still alive, and the director was able to meet with him prior to his passing. Ponseti International - a must-visit for any parent. The first step in the journey to find a care provider should be their list of Ponseti-certified physicians. It's important to find a doctor who strictly follows the Ponseti protocol (and who, preferably, learned the method from Dr. Ponseti himself and/or at the University of Iowa). MD Orthopedics - the go-to site for the "boots and bars" brace that all kids with clubfoot wear after the casting process is completed. Footnote Film Project - there's a documentary in the works about the treatment of clubfoot; they're currently fundraising to film internationally. Looks like a neat project! Tony Spineto, Clubfoot Triathlete - Tony is an endurance athlete who was born with bilateral clubfoot. He seeks to encourage and educate children with clubfoot and their parents, and he's currently writing a book about his experiences. To Parents of Children Born with Clubfoot - a message from Dr. Ponseti, hosted at the University of Iowa Children's Hospital site, discussing why it's so important to get a child's clubfoot treated properly. thanks for putting my blog on there! glad it was helpful :)) looking forward to reading your posts! I am thinking of starting a support group for preteen and older kids with clubfeet. Is there anything like that out there? I'm not sure. Maybe on Facebook? I really appreciate your blog. Thanks for sharing this useful information.